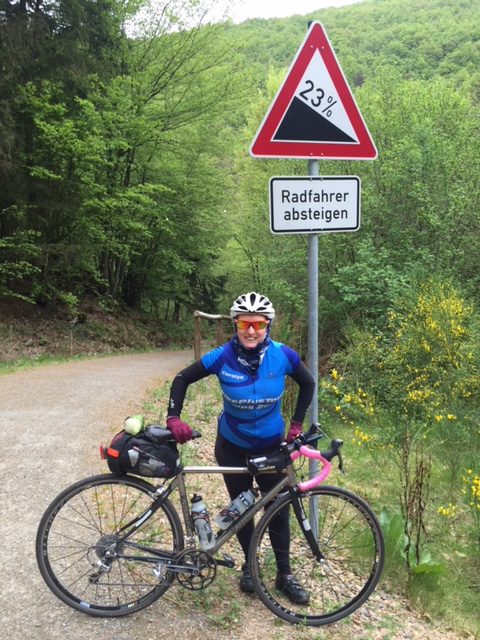 This week's Cycling Voice comes from Carolyn Hewett-Maessen, who I got to know when she lived in London and was a keen triathlete. She's now living in Colorado (not jealous at all!). However, things haven't quite gone according to plan and she is currently on a determined road to rehabilitation following a nasty accident. I really look forward to seeing Carolyn doing the Maratona dles Dolomites this year. "I started cycling 15 years ago, when I bought a bicycle from a friend at work who was selling his wife's bike. I was living in London at the time and figured it would be a much better commute and start to the day than taking the tube. I used to be a runner and spent seven years on Team Wiggle doing triathlon, but cycling is now my main activity. I do it to get from A to B, when touring with my husband, and of course to keep in shape. Usually I ride three or four times a week, more if I'm preparing to lead a group trip, in which case I focus on climbing. All of our trips involve climbing! At the moment I am getting back into cycling after a serious accident so I just do 10-15 minutes at a time, depending on how I'm feeling that day. My accident happened last summer and I have been in rehabilitation since. Unfortunately, I was stepped on by a 2000lb (907kg) horse which broke my hip, my femur and damaged my anterior cruciate ligament. I had grown up with horses, so got a part-time job at Breckenbridge Stables. One day last August, while I was in a pen with around 20 horses something in the trees spooked them and they stampeded. I had to have emergency surgery that day and was in intensive care for a week. Now I have a titanium rod in my femur, a screw through my hip, and another one through my knee. I feel fortunate that my leg was my only serious injury, as it could have been a lot worse. It was also helpful that the hospital I went to performs at least one emergency surgery on legs alone each night from skiing and snowboarding accidents, so they knew what they are doing! Rehabilitation has been really tough and frustrating. You go from being fit and able, to not being capable of showering or going to the loo alone, and being in constant pain. Although I am getting better there is still a long list of things I can't do, but a friend gave me some good advice saying I needed to approach recovery like aid stations in a race. Just focus on getting to the next one, which is what I now do. From walking frame and wheel chair, to crutches, to a single crutch, to a walking cane, to only having to use the cane outside. I'm pleased to say that this is day five of not using my cane at all, but I am currently in Florida, so the risk of slipping and falling on ice is non-existent! We will see how it goes when I am back home in Breckenbridge at 3000m altitude in the snow! The various doctors, surgeons and physios I work with estimate I could be back at full speed by August. I am lucky to have physiotherapists working with me that understand I'm an athlete who is committed to getting back to 100% and is doing the exercises they show me, so they have put me on an 'advanced' program to get me ready to ride the Maratona dles Dolomites cyclosportive in July. From October last year I was using a recumbent stationary bike for 10-15 minutes at a time. Then I kicked off the new year by using my Verenti road bike on the turbo trainer. I was able to ride for 15-16 minutes with no resistance before I started getting pain, but after playing around with my saddle position I have now twice been able to cycle for 35 minutes. Another aid station to celebrate! I still get frustrated sometimes. I would normally teach skiing part-time in the winter in Breckenridge, with around 100 days spent on the slopes. But this year I'm not allowed to ski at all. So now when my husband heads out to ski I head to the gym and swim, then do my physiotherapy exercises. But I remind myself of how hard it was in the early days. I keep a detailed log of what exercises I'm doing, how I feel and what improvements have been made. I'm very goal driven and competitive so it gives me a boost looking back when my exercise was literally bending my leg a few times, and I was living on a diet of pain killers. I have learnt to celebrate the small victories, which helps keep me positive. I love the social aspect of cycling, and have made so many great friends this way, and met some interesting people. I once got to ride with the 1960 cycling champion of Tuscany (Italy) just because he came across me cycling in his area. I really enjoy being able to take our guests on our trips to areas they wouldn't know existed, and experience with them these quiet back roads in the Alps, Pyrenees, Dolomites, or the Rocky Mountains - roads that they wouldn't otherwise get to ride. As an Australian who has lived in London, Nice, and now Colorado, as well as doing cycling trips all around the world I have seen so many different landscapes. In my opinion, when it comes to road riding, nowhere beats Nice. There are hundreds of beautiful tiny roads and the mountains start right there at the city. There is a reason why so many pros live around there! I got tired of the London traffic so I used to take the train out to Princes Risborough or Hitchin to ride from there. I love that cycling has exploded in London, but I found I had to ride earlier and earlier in Regents Park to escape the packs riding there. It stopped feeling safe and I hated that groups would ride three, four or five abreast, holding up traffic! Colorado has invested a lot of money into its cycle path infrastructure, with another $11 million earmarked for this year. There are fewer roads but everyone cycles here so you rarely hear of road rage against cyclists like you do in other parts of the United States. We have added a Colorado tour to our portfolio of trips which takes into account the high altitude, so we slowly acclimatise people, with the queen stage of the trip being Mount Evans, North America's highest paved road. At 4307m it's breathtaking - literally! I've had so many great cycling experiences. Riding across Tibet was pretty special, and my solo trip around Italy really hooked me on touring. Three weeks in Tasmania touring from vineyard to vineyard combined my two biggest passions! Last year my husband and I did three weeks cycling across the Netherlands, Germany and Belgium. My husband is Dutch so we went from friends and family catching up with everyone which was lovely. This year we have Arizona, Colorado, two trips in Italy, one in the Alps and one in the Dolomites scheduled. Not long after I got my first bike I set off on a three month journey cycling around Italy. I love to plan, but there is something so liberating about not knowing where I will be spending the night - car park, soccer field, back yard of a friendly local, abandoned house, a boat - these were some of the places where I bedded down when I couldn't get a camp site. These days our bike tours tend to be at a higher budget so we stay in hotels! My first road ride will be next month as we have a trip organised to Arizona in April for some early season training. (It's our equivalent of Majorca for the Brits!) There, I will see how I go with the lumps and bumps in the road, and how my balance is. I never cycle without my phone. I have been lucky enough to cycle in Tibet, Loas, Australia, Nepal, France, Italy, Austria, Spain, Slovenia, Germany, Belgium, Netherlands, New Zealand and the USA and there have been so many times I saw things I wanted to capture. I love to look back through pictures taken on the road to relive a trip, especially when I am currently only able to cycle in the gym! With my phone I find it helpful to play music out of my back pocket if I'm alone and on a tough climb. (I don't use earphones on the bike.) Lady Gaga has helped me bag a few Strava Queen of the Mountains that way, including climbing up Monte Zoncolan! At the moment cycling is a goal. If I'm cycling on the road for a decent amount of time it means I'm well on my way to being 100% again. Overall, cycling means freedom. There is something special about getting on your bike and exploring the country side, experiencing new cultures, meeting people you wouldn't normally come across. I love it."